Setco is a leading designer and fabricator of film sets for features and commercials, as well as, custom fabrication of large items, custom prop fabrication, prop rental, signage, retail displays and exhibits. We can do BIG! Big Jet Engine, Loaf of Bread; Insurance Card; Ravens Eggs. Even big foam costumes! You dream it and we can make it! Click on the thumbnail photos to enlarge the pictures. 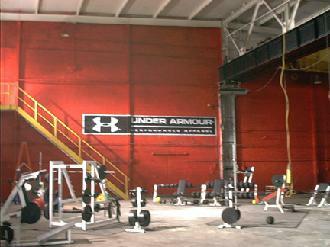 This Under Armour set involved taking a vacant warehouse painting the walls and floor as well as building the window wall. The window wall was 120' long, and 20' tall. We constructed a functioning 8' diameter fan for the wall. 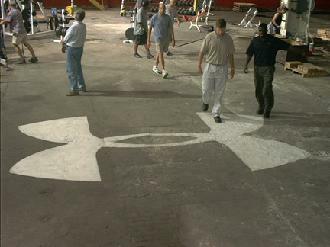 The Under Armour logo was painted on the existing floor and wall. Click on the thumb nails below to see larger photos for a Department of Defense job that consisted of 5 separate complete sets. All were designed and built from pencil sketches. 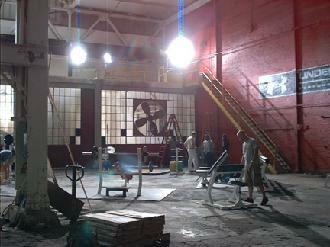 Setco Scenic Services is a full service Art Department located in Baltimore, Maryland. Our services include: Art Direction, Set Design & Construction, Prop Rental & Fabrication. Our company is made up of professionals that have been serving the Television and Film industry in the Mid Atlantic region for more than 20 years. We at Setco pride ourselves on our ability to design, construct and deliver a superior product on time and in budget.